There's nothing more useless than a broken mic stand. There's nothing more useless than a broken mic stand. Gator Frameworks builds their stands to last, so you don't have to go through that heartbreak. Their GFW-MIC-2020 tripod stand features a telescoping boom, along with a convenient twist clutch for height adjustment. You can adjust microphone height from 6" to 99", and the twist clutch ensures that the stand won't slide down in the middle of a show. Solid steel construction allows this stand to shrug off the inevitable abuse of life on a stage. Warranty: 3 years. Overview: The Gator Frameworks GFW-MIC-2020 is an adjustable microphone stand. It has a telescoping boom, and a standard twist clutch. The frame is made of black powder coated heavy duty steel construction. Included with the stand are two plastic clips to help you with cable management. The main shaft and the boom are terminated with standard 5/8" threads that are compatible with most microphone clips, and include threaded lock washers. Adjustable Height: The MIC-2020 can be adjusted to suit your needs. The stand's inner tubing can extend from the outer tube approximately 30". With the boom attached and fully extended, the maximum height for the stand is 99". Aim the boom downward, and you can lower a microphone to a minimum height of 6". Soft Touch Controls: All of the grips and knobs on the mic stand are covered with a soft-touch rubber, and feature the Gator "G" logo. The main height control features a friction clutch grip with squared edges for a non-slip grip. Tripod Base: The MIC-2020's tripod legs are approximately 13-1/2" in length. The ends are equipped with sturdy rubber non-slip feet, and removable red safety trim. The tripod legs collapse and fold into a compact form for storage. Stored length is 34". 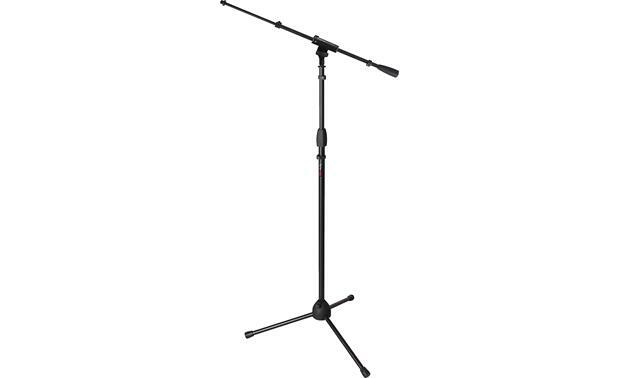 Searches related to the Gator Frameworks Microphone Stand Tripod stand with telescoping boom (Model GFW-MIC-2020).